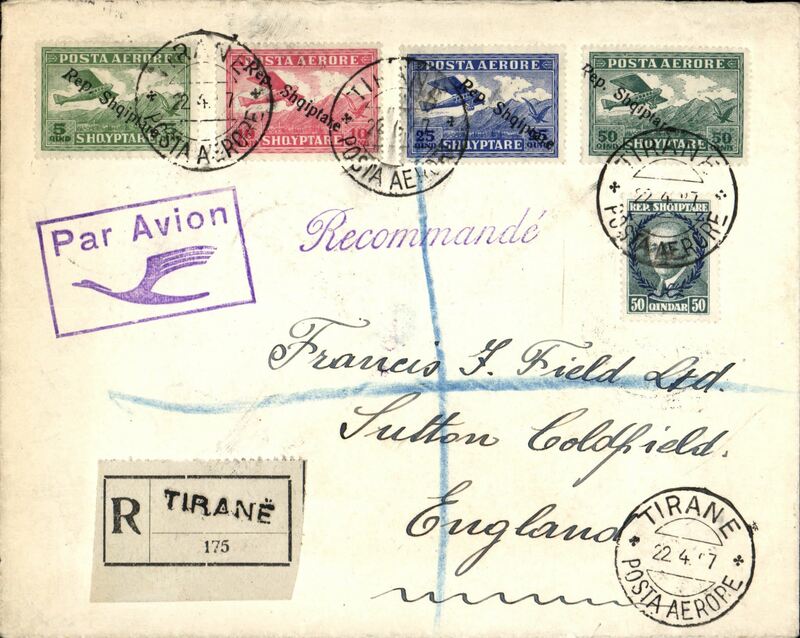 Early airmail from Albania to England, bs Sutton Coldfield 26/4/27, registered (label) commercial air cover to England via Vlone Posta Aerore/9.10.25, Brindisi Transiti/10.10.25", and Amb.Torino-Modane/ 137/24.4.27 transit cds's, arriving at London and finally 'Sutton Coldfield/26 Aug 27, franked 1927 air set ovpt. 'Republika Shqiptare' to 50q plus 50q ordinary, canc Tirane Posta Aerore/-8.10.25, fine strike violet framed "Par Avion" with bird in flight handstamp.The Turin–Modane railway is the international rail connection from Turin, Italy to Modane, France. A fine item with superb marking illustrating the early route from Albania to England. Francis Field authentication hs verso. Albania to Bulgaria, early airmail cover franked 20q 15q canc Tirane/Posta Aerore cds flown to Sofia, no arrival ds, via Brindisi 29/5, ms 'Par Avion'. Carried by two Italian and one French airline - first by the Italian Societa Aerea Mediterranea from Tirana to Brindisi via Valona, then by Italian Aer Espresso Italian S.A. to Constantinople via Athens, and finally by the French airline CIDNA from Constantinople to Sofia. Interesting item, uncommon origin/destination, nice routing. Albania to Bulgaria, registered (label) cover franked 50q, 20q 15q canc Tirane/Posta Aerore cds flown to Sofia, bs 6/8 (should be 9/8), via Salonika registered arrival/departure 7/8 cds (Goddard P8/10), black/pale grey 'Poste Ajore/Par Avion' Albania airmail etiquette, ms 'R/Par Avion'. Carried by one Italian and one Polish airline - first by the Italian Societa Aerea Mediterranea (S.A.M.) from Tirana to Salonica, then from Salonica to Sofia on the L.O.T. Salonica-Sofia-Bucharest-Lwow-Warsaw service. An uncommon item with great routing, ironed vertical crease, otherwise fine.